Heat oven to 400°F. In 3-quart saucepan or Dutch oven, melt butter over medium heat. Add celery and onion; cook and stir until tender. Stir in soup, milk, poultry seasoning, salt and pepper. Cook until thoroughly heated. Gently stir in turkey and thawed vegetables. Pour into ungreased 2-quart casserole or 10-inch quiche pan. 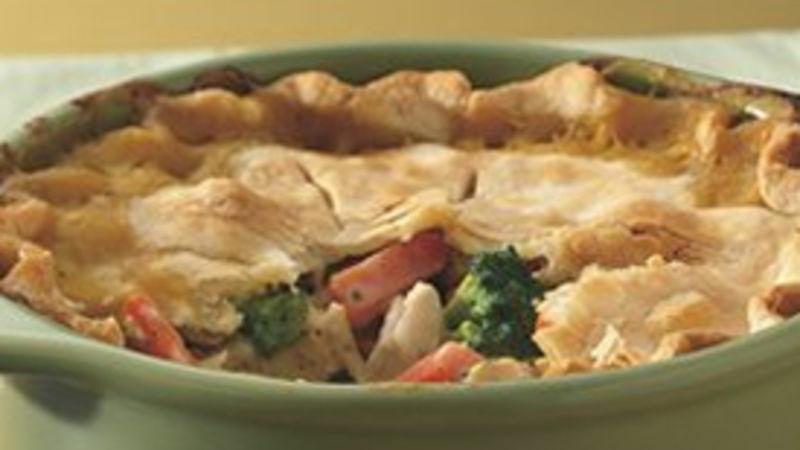 Remove pie crust from pouch; place flat over turkey mixture. Roll up edge of crust to fit top of casserole; flute edge. Cut slits in several places in crust. Bake 40 to 50 minutes or until golden brown. Let stand 10 minutes before serving.